Children need to be taught that the Dentist is there to help them look after their teeth , but only to help! The groundwork needs to be done at home with the Parent and Child! The most important factor in ensuring that a child grows up with a healthy mouth and a confident smile is to help educate them with an open, inclusive and positive approach towards looking after their own oral hygiene. It only takes a few simple steps which takes very little time, and they can look forward to a lifetime of good Dental Health. It should become part of the daily ritual, just as important as staying clean to avoid illness. Furthermore, once the child is set on the right course, they can then easily continue these good habits throughout their life. Initially it is a chore to get a young child up and running, and it also requires monitoring at home, and with the dentist to ensure no bad habits creep in, however, it should never be seen as a punishment or duty, but more as a healthy positive step towards maintaining ones own body in tip-top shape! Tooth Brushing. The frequency of twice daily is now mainstream but many don’t know why! Simply put, the soft Plaque deposits which are responsible for most Dental Diseases, harden and calcify when exposed to the saliva over a period of 14-18 hours. We attempt to break this cycle, by eliminating the Plaque when it is still soft and can be cleaned away with a toothbrush. Therefore every 12 hours (or twice daily) should achieve the desired result. However the technique is very important to ensure adequate removal of Plaque, so this is where the Parent and Dentist need to come together so that individual difficulties can be addressed. Once a good habit is established, it can see you through 90 years of service! Flossing. This is normally used when the permanent dentition has established itself, due to the age, dexterity needed and better compliance of the young adult. However, nowadays, Baby or Deciduous teeth can benefit just as much but this technique requires parental help. Simply put, it is a different tool used to eliminate plaque in hard-to-reach areas such as between the teeth. The technique is more difficult but the use of Floss or other interdental aids (e.g.. Te-Pe brushes), can make all the difference in avoiding tooth decay and gum disease as we age. Diet. We could write a book! Modern wealth and access to unhealthy acidic or sugar-rich foods and drinks, has caused huge problems with global levels of Dental Disease but is also seen in epidemic proportions with regard to obesity, childhood nutritional deficiencies and reduced overall health. All I would like to say on this forum, is that “tough love” must be practiced by parents (of which I am one), and reduction of daily sugars and poor foods is our responsibility as parents in providing as best we can for our children. All we need to do is adopt a healthy awareness of what we consume and to minimise those foods/drinks which damage our bodies in excess! “IN EXCESS” is important, as our bodies can manage very well when exposed to small levels of “bad foods” and the two methods above will keep our teeth healthy in those instances. Frequency of intake and the way food/drink is consumed, is everything…once the home care and maintenance is in place. Visit the dentist regularly. This ensures that any hidden problems can be addressed as early as possible, saving money, time and unnecessary stress! It often serves as a reminder to young patients who are fed up of listening to parents “moan and groan” about teeth, to have a stranger enter the mix and reinforce good habits. I try to keep the messages simple and easily remembered. I find a better compliance rate this way and even after 20 years, I am still surprised by some teenagers, when they really DO listen and improve noticeably with each visit! The final responsibility rests with the patient trying to manage their own health on a daily basis and they cannot do this if the benefits of Dental Health doesn’t interest them. 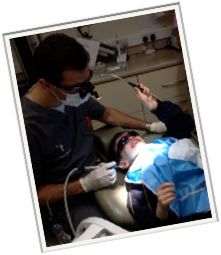 Our role as parents and dentists is to show by example how much Dental Health means to us and hope they follow suit!